Currently, Top Chef–er Marcel Vigneron’s new show, Marcel’s Quantum Kitchen, is airing on SyFy. An estimated 600,000 viewers tuned in to the premiere, and one of those viewers was Julia Langbein. With a new episode set to air tonight, she shares some thoughts on the series. 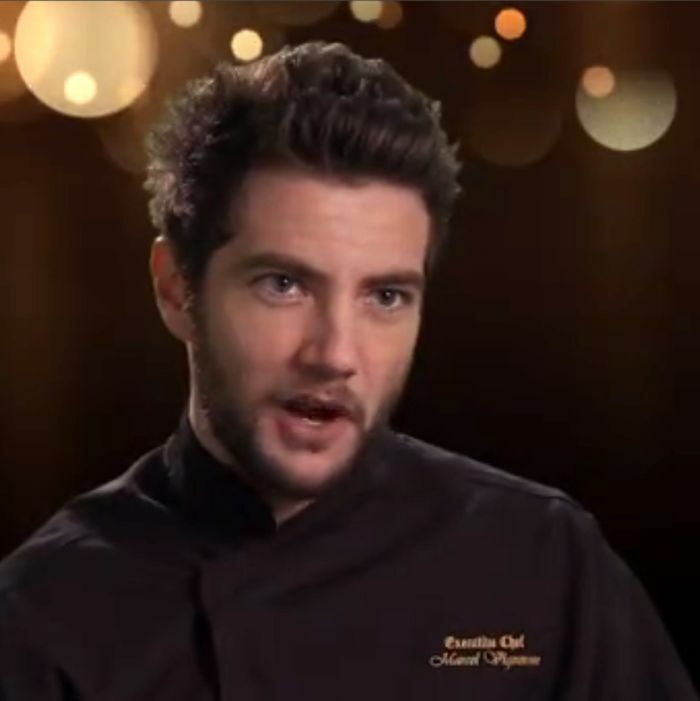 To some, Marcel Vigernon is the mean dork who came in second to Ilan Hall in season two of Top Chef. To others, he’s the mean dork who brought “mad scientist” technique to the show way back before Ferran Adrià was getting name-checked by your aunt Mary over manicures. We’re pretty sure the show’s aim is to convert Marcel’s reputation from jerk to genius-jerk while testing whether molecular gastronomy can be brought out of the controlled atmosphere of a restaurant kitchen and into catered private events. As for this whole “food of the future” business: Predictably, there are a lot of sciencey-yet-pedestrian graphics on this show, the way that someone on CSI will go, “Captain, I’m going to order pizza” and a transparent holographic computer will pop up making beep-boop-bop noises, scan a dead woman’s retina, and then start spitting out addresses for EVERY SINGLE PIZZA PLACE IN THE AREA before you realize the character is just doing a Google search. Wait! This looks almost exactly like Trader Vic’s notepad from circa 1961, so maybe we did quantum leap? The premiere episode itself dealt with Marcel’s first molecular catering party, at a swank L.A. mansion, which is attended not only by the rich and influential but by a Bengal white tiger. This is because the event is a fund-raiser for a wildlife sanctuary responsible for the well-being of exotic animals (except apparently tigers). The skeptical terror in the baboon’s eyes is so, so real. But it’s going to look SO HOT in three coats of mascara! Back in the kitchen, Marcel’s driving principle for each dish is what he calls “form-mimicking,” e.g., a giant meat log made of short rib “bark” padded around a roast beef “trunk” using Activa RM, a live enzyme that makes meat stick (and is not to be confused with Activia, a live enzyme that makes moms comfortable talking about their “schedules.”). It’s as if Marcel shot so far into the future with his trompe l’oeil fairy forest meat trunk that he wrapped back around to the beginning of time and he’s making illusion foods that would fit right in at a medieval court festival. And you know melted grated cheese cooled over a dowel is futuristic, because it’s in the Martha Stewart Hors d’Oeuvres Handbook, which I’m guessing is from 30 years in the future because it gave me menopause when I read it. Anyway, a new episode of Marcel’s Quantum Leap Kitchen airs tonight at 10 p.m.on the SyFy channel, which an adult television executive must have gone back in time to infancy in order to spell like that. Earlier: Why Is Everyone So Down on the Term ‘Molecular Gastronomy’?